Resists corrosion in humid environments - Includes FREE 112-D sling! Resists corrosion in humid environments - Includes FREE sling! 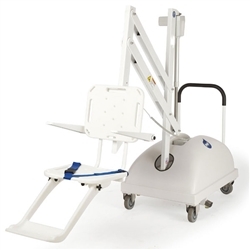 Offers manual lifting capabilities up to 400 pounds and is easily portable for storage. Fully ADA compliant Pool Lift! There are many featured upgrades and accessories specially designed for the Pro Pool Lift. The Scout 2 is an ADA Compliant pool lift designed for in-ground anchoring. The Ranger is ideal for use on smaller hotel and motel swimming pools. Fully ADA compliant SPA Lift! 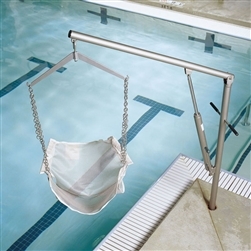 Versatile and fully powered, this lift works on both in-ground and above ground pools! Simply wheel this pool lift to the poolside, quickly deploy, and it’s ready to use. An easy-to-use 2 button water resistant remote control gives the user full independence when using the lift. No need to mount into a Pool or SPA deck, this lift is completely portable. Our FIXING KIT (included) secures the lift in place, allowing for FULL ADA COMPLIANCE. The Patriot lift is counter-weighted using a sand ballast. Sand can be sourced locally, saving substantial freight costs. Quality stainless steel construction and UV resistant powder coat finish ensure a long life and corrosion resistance. The Revolution is designed to be self operated by the individual user. We now offer a wide range of pool lifts to suit individuals with a variety of physical disabilities and handicaps. Whether you have a pool that is outdoors or indoors, these lifts will help you enter and exit the pool with ease. A number of our products are ADA compliant and all of them are built to exceed your expectations where safety and quality are concerned. Call Wheelchair Authority at 1-866-218-0902 today!